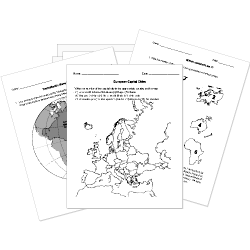 Check out our pre-made Geography worksheets! You are browsing Grade 1 questions. View questions in All Grades. You can create printable tests and worksheets from these Grade 1 African Geography questions! Select one or more questions using the checkboxes above each question. Then click the add selected questions to a test button before moving to another page. Where is the longest River in the world , that flows over 4,100 miles into Mediterranean sea? In what part of Africa do giraffes, zebras and lions live?